Be the first to share your favorite memory, photo or story of Deanie. This memorial page is dedicated for family, friends and future generations to celebrate the life of their loved one. Deanie Jackson, 84 of Amsterdam, Missouri passed away January 5, 2019 at his home in Amsterdam. Funeral services will be 2:00 PM Wednesday, January 9, 2019 at Mullinax Funeral Home (660-679-0009) in Butler, Missouri with Pastor Bill Read officiating. There will be no visitation. Burial will follow services in Crescent Hill Cemetery, Adrian, Missouri. Memorial contributions are suggested to the Lupus Foundation. Messages of condolence for the family may be left at www.mullinaxfuneralhome.com. Richard Dean “Deanie” Jackson was born November 28, 1934 in Adrian, Missouri, son of John Martin and June (Schiller) Jackson. He was a 50-year member of Masonic Lodge #141, a veteran of the Navy, and retired after 30 years at R.O. Products in 1997. 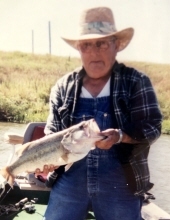 His life’s passion was fishing, and he was always ready to help others in the community. Deanie was a loving friend, husband, father and grandfather. He was united in marriage to Elizabeth (Ditty) Talley on August 10, 1957 in Amsterdam, and they spent their entire married life there. To this union, two daughters were born. Deanie was preceded in death by his wife, Elizabeth (Ditty) and grandson Danny Beebe; 5 sisters, and one brother. He is survived by Wilma Walley of the home; 2 daughters Julie Beebe of Amsterdam and Kim McLay and husband Jimmy of Drexel, Missouri; 4 grandchildren Ashley, Nikki, Brad and James; 5 great-grandchildren; and 3 brothers Bobby Jackson, Eddie Jackson and Clyde Jackson; and one sister Betty Jackson. To send flowers or a remembrance gift to the family of Deanie Jackson, please visit our Tribute Store. "Email Address" would like to share the life celebration of Deanie Jackson. Click on the "link" to go to share a favorite memory or leave a condolence message for the family.